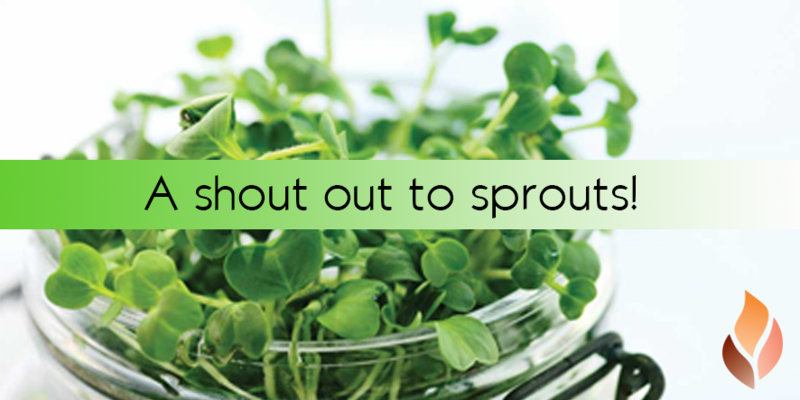 Home » Events and Blogs » Blog » A shout out to SPROUTS! A shout out to SPROUTS! Yes, they look a little like grass. But this type of living food can not only be grown yourself (very VERY easily! ), but can bring an incredible amount of nutritional benefits to your diet. Sprouts can contain up to 100 times more enzymes than raw fruits and vegetables. Plus, during the sprouting process, the content of vitamins and essential fatty acids also increase! Sprouts can effectively support cell regeneration and they have an alkalizing effect on the body. Known to have anti-cancer properties, courtesy of the enzyme “sulforaphane”. A significant dietary source of phytoestrogens. Also a good source of vitamins A, B, C,D, E, F and K.
High in vitamins B, C, E and many minerals. Good sourse of protein, fiber, vitamin C and A. Contain 26% protein and can be eaten without cooking. Contains minerals, healthy fats, essential fatty acids, fiber and phytosterols. It’s also one of the highest in protein. Good source of vitamins A, C and folic acid and one of the highest in protein.